McLaren Automotive will be presenting the groundbreaking new MP4-12C to a public audience for the first time at Goodwood Festival of Speed, which takes place from Thursday 1- Sunday 4 July 2010. Current Formula 1 World Champion Jenson Button and 2008 Formula 1 World Champion Lewis Hamilton will drive the 12C up Goodwood Hill on Saturday and Sunday respectively in the Supercar Run. Following their test of a ‘XP Beta’ 12C prototype at Goodwood Motor Circuit in March this year, Jenson and Lewis are excited at the prospect of piloting one of a new generation of 12Cs, the VP9 Validation Prototype car. Finished in traditional McLaren Orange, a solid hue made famous by Bruce McLaren’s racing cars of the 1960s and 70s, VP9 references McLaren’s past and future. Sports car enthusiasts will see a new 12C prototype car on the McLaren Automotive stand, which is situated adjacent to the Sunday Times Supercar Paddock. Finished in Elite Volcano Orange and featuring a carbon fibre splitter, diffuser, engine covers, engine bay panels and seat backs, this 12C is fitted with lightweight forged alloy wheels in Stealth finish. Also on display will be a 12C rolling chassis and the Le Mans-winning McLaren F1. A team of McLaren specialists will be on hand to answer queries relating to the 12C and the McLaren F1. Motorsport fans will be excited at the prospect of seeing the 1995 24 heures du Mans-winning McLaren F1. GTR1 won the legendary endurance race on its debut and in turn, secured for McLaren a unique ‘triple crown’. To date, no other manufacturer has won the Formula 1 World Championship, the Indianapolis 500 and Le Mans 24 Hours. At Goodwood, the public will discover a new type of high performance sports car. At the heart of the 12C is a unique one-piece carbon chassis, the ‘MonoCell’. Current competitor models in the ‘core’ sports car sector all feature heavier aluminum or steel structures that limit ultimate performance. The 12C has been designed around the driver, and its development has been overseen by a team with extensive experience in Formula 1 racing and engineering. Outstanding aerodynamic efficiency and bespoke technologies including Proactive Chassis Control, Seamless Shift dual-clutch Gearbox (SSG), Brake Steer, and the 12C’s unique Airbrake feature in a car which has been developed using Formula 1 simulator technology. Also on the McLaren Automotive stand will be a 12C rolling chassis, enabling viewers to see under the skin of the car and understand exactly how each bespoke component of the 12C is positioned around its lightweight and stiff carbon MonoCell. 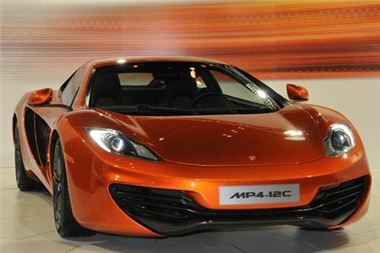 The new McLaren MP4-12C will be sold initially through 35 global retailers committed to exceptional customer service, in 19 different countries around the world from Spring 2011. The 12C will compete with other cars in the ‘core’ high performance sports car sector, which are priced between £125,000-£175,000.